Transactions are the way that inventory is changed in XpertMart™; i.e. it is only by way of a transaction that quantities are added or subtracted to the stock level of a store or warehouse. If Catalogs can be thought of as the heart of the Main station, then Transactions are the heart of the Remote Station. In fact, except for a couple of exceptions, transactions can only be done at the Remote station. (Purchase Orders can be made at both the Main and the Remote while Cost Adjustments can only be made at the Main.) To learn why, read more about our Philosophy of Control. There are twelve possible transactions that can be done at a Remote: Sale, Lost Sale, Sale Order (layaway), Return, Receipt, Return Receipt, Purchase Order, In Slip, Out Slip, In Slip Correction, Out Slip Correction, Adjustment, Cost Adjustment and Count. Each one of these affects inventory in a different way. To learn more, read the How Transactions Affect Inventory topic. Though each transaction differs somewhat in appearance, every transaction screen is remarkably similar. This is because the Object-Oriented design behind XpertMart™ means that the software is very modular: if you know your way around one transaction (such as an Invoice) then you will quickly find your way around any other transaction (such as Purchase Orders, Returns and Out Slips). This chapter will discuss the basic design behind all transactions. Subsequent chapters will treat each transaction individually. 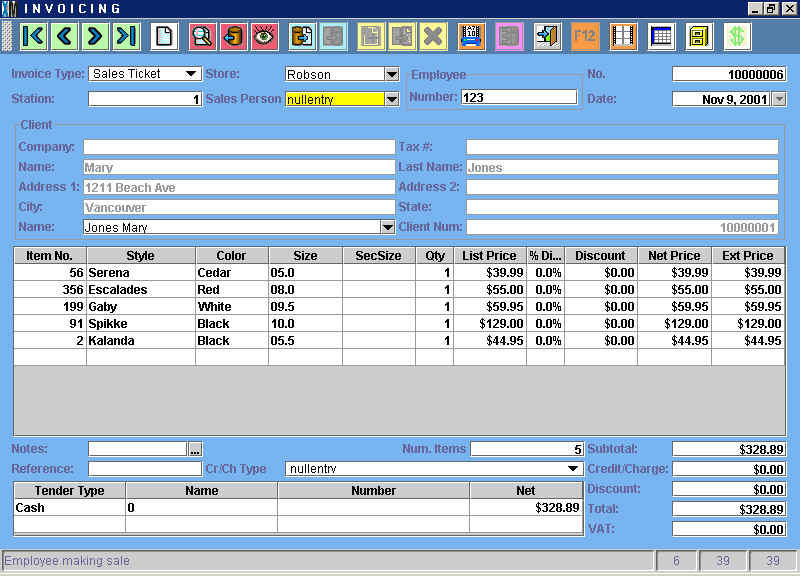 A transaction screen has five principal elements: the Toolbar at the top that is the same in every transaction; a Header that contains information about the transaction; a Customer/Vendor Subform; the Items Area where the items being added or subtracted to inventory are listed; and the Footer with item totals, aggregate cost or price and any payment information. Help: Pressing this button launches the online Help feature. This is feature contains the User's Manual and can be browsed or searched by topic. Exit: Press this button to exit the transaction and close the screen. Think of this as the "cancel" button when you need to terminate a transaction. Note that while you can always end a transaction by closing the screen (pressing the x in the upper right hand corner) doing so sometimes records a blank transaction in the system. The safest bet is to use the F2 button. Customer: Pressing this button moves the cursor to the beginning of the Customer/Vendor subform, where you have the option of entering a Customer or Vendor, depending on the type of transaction. Using the matrix is particularly useful for transactions that involve a large number of quantities such as Purchase Orders, Receipts, Out Slips and In Slips. 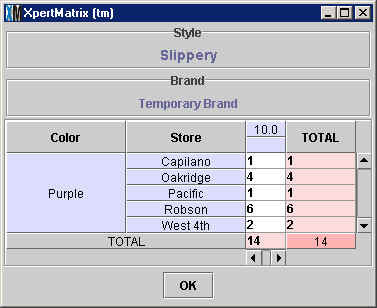 Entering item quantities through this matrix can save you a lot of data entry time. Items: Pressing this button moves the cursor to the first line (or next available line) in the Items Area. Use this button if you want to move through a transaction quickly and skip straight to the entry of item data. Quantity: Pressing this button moves the cursor to the Quantity column in the Items Area where you can enter the quantity of a specific item being entered in the transaction. Item Discount: Pressing this button moves the cursor to the % Discount column in the Items Area where you can enter the discount, if any, applicable to the item being entered. Item Lookup: Pressing this button opens the Items Catalog. You can browse the Items Catalog or do a Query if you are looking for a specific item. When you press <OK> to close the Items Catalog, the item you have selected will appear in the Items Area of the transaction screen. This function is particulary useful when you need to enter an item into the transaction and cannot remember the item number and a bar code is not available for scanning. Global Discount: Pressing this button moves the cursor to the Global Discount field where you can enter the global discount (if any) applied to the items in the transaction. The Global Discount is expressed as a percentage. Whereas the Item Discount (F7) applies only to a particular item, the Global Discount is a discount that applies to the total, or sum of all of the items in the transaction. Payment: Pressing this key moves the cursor to the first (or next available) line in the payment area in the transaction footer. The payment area is used in Sales, Sale Orders and Returns and is where you specify how the customer is paying for merchandise. PDT: Use this button when you want to download item data from a Portable Data Terminal. Once you are finished scanning items into the PDT, connect the PDT communication cable to the computer and press F11. The PDT will then download the stored item data into the Items Area of the transaction. For more information on using a PDT, read the Count Sheets section of the Physical Inventory topic. Print: Press this button when you are finished with the transaction. When you press F12 the following happens: the transaction is stored as a document in the appropriate document catalog, the transaction is recorded in the Kardex or Audit Table, and a paper copy of transaction is printer out. In other words, once you press F12 there is no turning back: the transaction can no longer be edited or deleted. The format of each transaction and the printer it is is printed out on depends on the printer driver you have configured in the Configure Documents Menu, under the Configuration Menu in the Main Menu. XpertMart™ will not let you print (or save) a transaction until every process within the transaction (such as having the right payment) is done correctly. The transaction header contains a set of fields with information about the transaction taking place. Some of these fields vary depending on the transaction you are doing, but you will always see at least three fields: the Employee, the transaction Number (No) and the Date. These three pieces of information are "stamped" onto the transaction by XpertMart™ and therefore the contents appear in gray, i.e. they cannot be modified or edited. In some transactions, the time is also stamped onto the transaction, in addition to the date. These fields are a critical part of the audit trail that is created every time a transaction is made and allow managers to trace which employee carried out the transaction and hold them accountable. Note that the Employee field refers to the last person who logged in to the system. In some transactions, such as an Invoice, there is a separate field for Sales Person, who may or may not be the same person who is logged in and carrying out the transaction, that is useful for tracking commissions. The transaction number is a consecutive serial number automatically assigned by the system. The transaction number is always 8 digits long. The very first digit indicates the store where the transaction is being done: 10000008 indicates that the transaction is being done at store #1 whereas 70000244 indicates store #7. When XpertMart™ is installed in a store with multiple workstations or points of sale, the Transaction Number assigned at each workstation is considered provisional until the end of the day when the system can consolidate all sales and assign permanent serial numbers. Note that every Document Type has its own number series, so that different Invoice Types will each have a 10000001 numbered document. The rest of the fields of the header are open fields and are to be defined by the user, usually by selecting an option from a drop-down menue. These fields might include the Price List in an Invoice, the mode of Transport in an In Slip, the Purchase Order number in a Receipt, and the destination Store in an Out Slip. In a few cases, these fields will also be automatically filled in by XpertMart™. Directly below the header in the transaction screen is the Customer/Vendor Subform. Recall that a subform is an embedded catalog. This subform gives you the option to select either a Customer or Vendor. If you consider that all transactions are either adding or subtracting items to your inventory, this makes a lot of sense since those items all have an origin (they come from a Vendor or, in the case of Returns, from a Customer) and a destination (usually a Customer but, in the case of a Return Receipt, a Vendor). The exception is In Slips and Out Slips which involve moving items from one store to another. In these cases, teh store is defined through a drop-down menu in the Header. The Customer or Vendor subform is a Look-Up by Example Menu which means that you can type in a search directly into the name field. In the example below, the user has typed the letter "J" into the Name field and all customers whose last name begin with "J" appear. (Note that the Look-Up by Example Menu is case-sensitive). If the Customer or Vendor is not already in the Catalog, you can open the Customer or Vendor catalog by pressing the zoom button to the right and add their data then. When you are done, save your changes and close the catalog. You will return to the transaction screen with the Customer or Vendor data filled in. 5) By downloading item data from a PDT (by pressing F11). Once you enter an item into the transaction screen by any of these five methods, XpertMart™ will automatically fill in other information about that item such as the Style it belongs to, its Color, Size, Second Size, and its Price. You can configure which of these attributes will appear in a transaction screen. To lear more, read the Simplifying the Transaction Screen topic. Once you have entered an item, you then need to specify the quantity and the discount, if any. XpertMart™ will then calculate and display the Net Price (the price after the discount) and the Extended Price (the Net Price multiplied by the Item Quantity) automatically. Note that you can specify the discount as either a percentage or dollar quantity. You can configure XpertMart™ so that when you enter the same item into a transaction more than once, it is automatically grouped on one line and the Item Quantity is adjusted accordingly. For example, if you enter Item 144 with a quantity of 2 and three lines down you again enter Item 144 with a quantity of 1, rather than have Item 144 appear on two lines, you will see it appear on one line with an Item Quantity of 3. If you need to delete an item from the Items Area, simply move the cursor over that item and press the <Del> or <Backspace> keys. The changes you make to the on-screen display of the Items Area have no impact on the way the transaction is printed since the format is predetermined according to the printer driver you have selected in the Configure Documents menu. The footer of the transaction varies according to the type of transaction, but at a Minimum includes a summary of the Items Area, including the total Number of Items, the Total Price (in the case of Invoices, Sale Orders and Retunrs) or Cost (in all other transactions) and any applicable Tax. These fields appear in gray as they are automatically filled in by XpertMart™. Every transaction footer also includes a Notes area where there is no restriction on the quantity of text you can enter. The other elemens of the footer vary according to the transaction but can include payment fields in the case of a Sale (shown below), fields to specify Delivery and Cancel dates in the case of a Purchase Order, and fields to specify the invoice number and date of a vendor in a Receipt. Once you've opened a Document Catalog, you can use the toolbar at the top of the catalog to find the document (or prior transaction) you are looking for. You can do a quick query or look-up by example in the date field to narrow your search to the transactions done a certain date. Once you've found the document you are looking for you can always reprint it (by pressing the button at the top). You can also print out bar code labels for every item in the Items Area of the document by pressing the button).